The Green Eyeshade has evolved over the 40 years beginning in 1970 from an art supply store and gallery for the original owners Dorine and Thorne Edwards, selling the Edwards' artwork, fine china, glassware, jewelry , and gifts. I worked for them for ten years, and took it over when they were ready to retire 20 years ago. 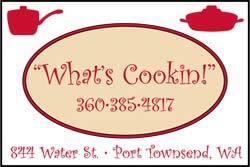 My greatest interest was to upgrade and increase our kitchen offerings as well as have beautiful and useful products. We have small appliances, excellent cookware, table and kitchen linens, a twenty foot wall of gadgets of all kinds, candles, casual dinnerware, bake ware, wine stems and glassware of all sorts, flatware, grilling supplies, cookbooks, cutlery, paper products, baby accessories, wood products, bar supplies, and last but not least, fabulous jewelry. Great customer service is our way of life. We do Special Orders, free gift-wrapping, and can ship your purchases anywhere in the US via UPS. Our staff is knowledgeable about our products and loves to help you pick out the perfect gift or something you need for your own kitchen. 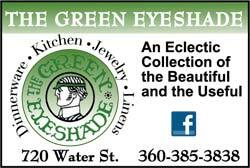 We at the Green Eyeshade love being part of the Historical District on Water Street in Port Townsend and would love to have you stop in and say "Hello".